The Aggie softball team (18-13, 2-7 SEC) defeated No. 4 Alabama, 4-3, in the third game of conference play, handing Crimson Tide their first loss of the season. After suffering losses in the first two games of the series against Bama, Payton McBride hit a walk-off RBI single to give the Aggies the win. “Today, we were just going up there and attacking the strike zone making sure that we got the pitches and our defense was going to protect our pitcher,” McBride said. Alabama opened up the game by scoring two runs off of starting pitcher Kendall Potts, giving the Tide an early advantage. In the bottom of the third, Texas A&M freshman Morgan Smith hit a double after knocking a line drive into the left field corner. With two outs, Baylee Klingler hit an RBI single to right field to open up the scoring for the Aggies. The Crimson Tide would add another run with a second base tag-up from Wallace at the top of the fifth. Wallace rounded third and scored after the throw to home from the Aggie defense was overthrown. The Aggies continued to rally as McBride started off the bottom of the sixth with asingle between shortstop and third. A subsequent double by Abby Smith set up an opportunity for the Aggies to score again. On full count, Morgan Smith hit an infield pop fly between Crimson Tide pitcher, shortstop and third baseman that fell, scoring Abby Smith and putting runners on the corners for the Aggies. Kelbi Fortenberry hit a grounder and another Alabama error allows A&M to tie the game up after six. Still tied in the bottom of the seventh, Alabama brought in Sarah Cornell to pitch after a walk was issued to Blake-Ann Fritsch. With two outs and runners at first and second, a base hit to center field off the bat of McBride scored the final run of the game, securing the win for the Aggies. 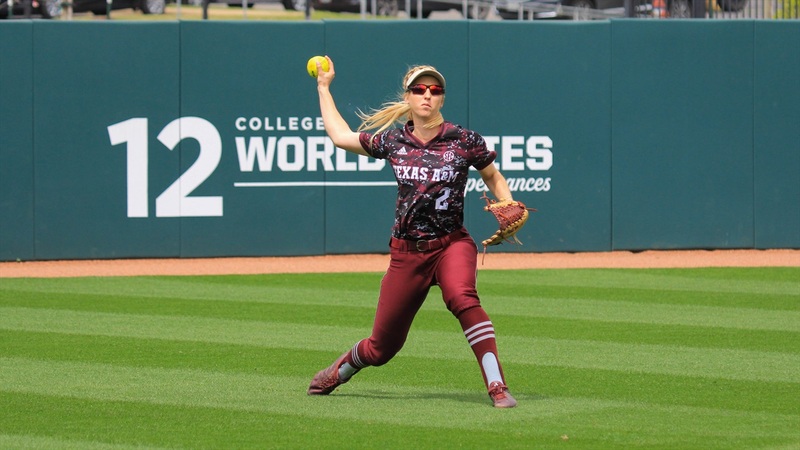 The Texas A&M softball team will seek to keep their momentum in a double header against Sam Houston State on Wednesday. The first game will begin at 4 p.m. at Davis Diamond. Great game by the Aggies to be a very good Bama team. Excellent. We needed to avoid the sweep!!! Congratulations to the players on a VERY important win. We're not exactly a good team this year due to all the attrition but these girls can scrap. I'll give them that. Also props to them for beating Alabama for the first time since I started following softball seriously. No one had beaten Bama this year until Sunday. Potts pitched a Complete Game. 4 hits 2 HR's 3 K's and 7 walks. The 2 HR's were single shots in the first inning. 2 hits given up the rest of the way. 7 walks did not hurt her. Team had NO Errors which was huge. A. Smith a sophmore hit a Double and either Meagan or Morgan Smith got 2 hits one being a double. Both Meagan and Morgan are Freshman. The team only struck out 5 times, one player was responsible for 3 of the strikeouts. We had an error that gave Bama their 3 rd run. Awesome win, we can beat anyone in the country if we hold them to 5 runs or less. This victory and the one over LSU shows that this team isn't devoid of talent. Right now the focus is going to be coming together mentally and learning to string some victories together, which will go a long way to getting us into a regional, which at this point isn't a given. On the winning run play, did anybody else notice how the Alabama third baseman ran just in front of Blake-Ann before she got to third base? Probably an innocent move to get to a cutoff spot but I wonder. Good thing Blake-Ann didn't break her stride. After seeing the replay...I am not so convinced it was actually innocent. Interference between infielders and base runners in softball is more common than in baseball and probably more important to the outcome of games. When we scored our two runs in the 6th inning I believe, the Tide coach was arguing interference on our runner going from 2nd to 3rd on the mini-pop fly between their pitcher, shortstop, and third baseman. One base runner interference that I remember many years ago occurred at the final super-regional game versus I believe Arizona or ASU. We were ahead in the bottom of the 7th with two outs on Arizona when their base runner going from 2nd to 3rd prevented our shortstop from fielding a ball which would have ended the game. Instead, the ball went into left field, Arizona eventually won the game, and went to the CWS. I remember Jo arguing so hard that she got thrown out of the game. That may have been the only time. The distances between softball bases are so short that any bobble by the infielders almost certainly result in base runners. Those short distances result in the infielders playing virtually in the base paths. The result will be lots of discussions. of base runner interference.